Just like any collective that’s headed towards a dead end, the Kremlin team has been directing its thoughtful gaze back to a time when, as it sees it, everything was good, correct, and even ideal. For them, those times were the years of Stalinism. Their instinctive draw to precisely those times and those experiences has already become simply impossible to camouflage. There’s too much at stake now to darken or mask their own archaism or to feign a sense of balance or even a contemporary outlook. There’s no longer any possibility for balance today. The appeal to Joseph Stalin for a recipe that will save them has been sounding out across the entire problematic front. And Putin’s prescription for the siloviki and military industrialists “to carry out as powerful a breakthrough in modernization of the military sector as we had in the ’30s” – this is only one of the latest examples of the leaders’ return to their roots and origins. But this example might also be the most characteristic one. For it’s precisely the Russian military complex that has been chosen to prove to the people – and, if it’s useful, to the entire world – that our old government not only knows how to spout off rhetoric, but also still understands something about these matters and is capable of implementing at least some sort of grand projects. It was not for nothing that at this same session of the Security Council, Vladimir Putin once again guaranteed 23 trillion rubles in financing for our weapons program, regardless of its obvious impracticality, and as a compelling point remarked that, for “the past thirty years,” the Russian military-industrial complex has “missed several cycles of modernization” due to a lack of financing. “The past thirty years” instead of the “past twenty years” that comes to mind – this is an innocent oratorical trick. Otherwise it would turn out that two-thirds of this era of decline occurred during Putin’s own rule. But the main thing in this speech was not that, but the plan it included to reset military industry, with all its concrete provisions. Their structural, and in some cases textual, similarities to Stalin’s respective provisions bring about the same sensations as one gets from watching an old newsreel. Stalin had “six conditions” for industrial development. Putin does as well. True, he only has four (three that are enumerated and another supplemental one about conditions for making analogs for us of foreign weapon designs). But in discussing, for example, the cadres, we can say that the two leaders quote one another. Incidentally, it’s possible that these aren’t quotes of each other, but just a similarity in their directions of thinking. With the difference that Stalin knew how to achieve the goals he set, while Putin, it seems, just doesn’t sense what it is in the 2010s that differs from the 1930s. 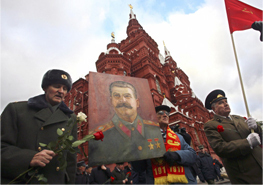 Nothing that Stalin’s modernization relied on still exists today. During Stalin’s first five-year plans, from 1928 to 1940, the number of people employed in the industrial sector tripled, and in heavy industry even quintupled. The working ranks were filled up by peasants fleeing from collectivization, women (whose representation in industry rose from a fourth to nearly half), and people from the decimated urban private sector. In today’s Russia, there’s no way to help any large sector of our economy by force of numbers. The price of modernization in the 1930s was radical, as was the catastrophic decline in the standard of living – particularly in the villages, but in the cities as well. In 2010, no demographic in Russia would agree to sacrifice itself for the sake of “modernization” in general, let alone for the “modernization” of the military-industrial complex. The motivation of workers, from the “little ones” to the “big ones,” in the 1930s was a mixture of panicked fear and fiery enthusiasm. None of our workers today, “from the rank-and-file worker and engineering cadres up through those of the company managers,” naturally, share either of those sentiments. One more detail that people don’t always remember. The most important driver of Stalin’s modernization was competition. For example, the competition between aircraft design bureaus, which proposed various fighter plane models. Or, conversely, the fight over resources between military factories that manufactured the same types of products. But Putin’s economy is a place where monopolization is not only imposed, but imposed with ferocity. In short, there are no points of convergence whatsoever. We do not need to repeat Stalinist modernization. If we have to remember it at all, it should only be in order to do the opposite. To renew today’s Russian economy, we need not socialism, but capitalism; not growth in military spending, but its reduction; not cuts in educational spending, roads, health care and in general everything that would make the country more modernized, but an increase in this spending. Perhaps Russian society is not quite mature enough for this kind of renewal. But still, Stalinist modernization would be categorically unsuitable. Just as other characteristic aspects of that way of life would be unsuitable. The romantic nostalgia of Putin and his circle for those past times is, for them, perfectly natural. This is their spiritual foundation. But every successive attempt they make to build contemporary political policy on this foundation only reminds us of the deepening inadequacy of our government representatives to do what’s possible and desirable.